A valid concern of any early stage founder is when and how much to spend on sales and marketing. In the few years surrounding an IPO, a company might allocate 40% of opex to sales and marketing, while a fledgling startup may have a single salesperson among a team of engineers. Most startups shouldn’t be spending much on traditional marketing – expensive PR campaigns and broad content efforts can take more than six months to come to fruition. The best leads will be those that come from referrals and direct sales efforts, since skipping the nurture stage means closing deals faster. That said, there’s a way to grow during your early days that won’t divert resources away from engineering. You can build marketing right into your product with little impact on your runway. When you can’t spend much on marketing, build it into your product from day one. Brilliantly executed by companies like Slack and Expensify, this approach involves deciding on key drivers of growth and incorporating them into core product features. Read on for ways to implement marketing tactics in your application. Ask This Question: What Do Users Need to Succeed? Once you’ve built and prioritized this list, decide which functionality you can include in your prototype and start testing it alongside core features before you launch. The best developers understand that onboarding can make or break an app, and a good onboarding experience can greatly reduce churn. Without in-product onboarding features like tutorials or progress indicators, you’ll have to rely on emails (which often go ignored) to encourage people to engage. Plus, you’ll spend too much time and money on answering simple support questions or providing services that aren’t scalable. And that’s if you manage to keep your users around – on average, 77% of users will abandon an app within 3 days of installing it. You can build onboarding into your product as early as your signup process. Foursquare is an example of an app that employed smart onboarding starting from the first time a user launched their app, and then made it even better. 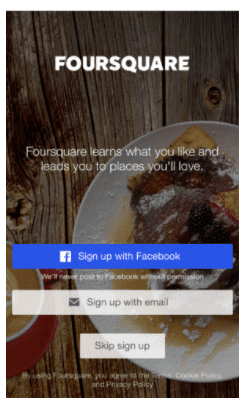 Back in 2015, Foursquare had people talking when it introduced an option to “Skip Sign Up”, when similar apps on the market didn’t give users access unless they went through the tedious process of creating an account. 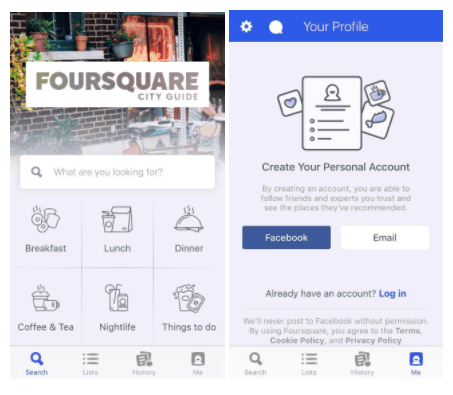 Offering an option to bypass the “Sign-In Wall” must have worked, because Foursquare went on to remove the Sign-In Wall completely and now brings users straight to the search page, meaning users can get straight into knowing the app and its features. For some apps, attention to onboarding needs to continue throughout the user’s experience, prompting users to complete training and perform setup tasks as they explore the application. There is no perfect onboarding formula that applies to every app. That being said, some of the best examples have a few things in common. They break the onboarding process down into easy, digestible steps that users can complete when they want. They only ask for information that’s crucial at the moment, spreading out the pain of form-filling and profile-building over time. And they make sure the user performs a few key actions as soon as possible so they don’t lose interest. In addition to having a good docs page and support options for your users, you can build support features into the product that encourage more activity. Companies like WalkMe make it easy to teach news users with tips and tutorials in the product, while tools like Intercom let customers live chat with your support team right from the app. Your current users are your biggest asset. They already derive some value from your product, so they’re more likely to spend a little more. It only makes sense to capitalize on your customer base for new revenue opportunities, and there are plenty of options to choose from if you take this angle: you could promote services, related products, or premium features to users already engaged with your app. Further incentivize these upsells by offering free trials first and customizing the messaging for those in trial mode. Your current customers are also most likely to refer you to someone else. You can allow paying users to bring in free users, rewarding both parties by giving them credits which can be redeemed as discounts. 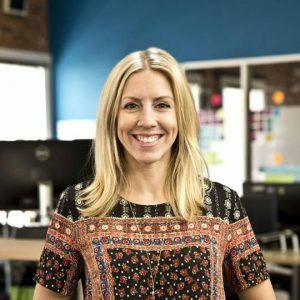 Companies like Uber and AirBnB have really nailed their referral programs, creating incredible user growth – not only have they saved the time, money and grunt work they may have spent on traditional marketing efforts, but they have also been able to step back and let their user base generate growth for them. The great thing about incorporating these tactics into your product is that it scales. Your user base can grow without demanding an equal increase in resources, and the logic you’ve already built keeps working for you with every new signup. When you do have a bigger marketing budget, you can spend it on powerful campaigns tied directly to the data on user activity you’ve been tracking from the very beginning. 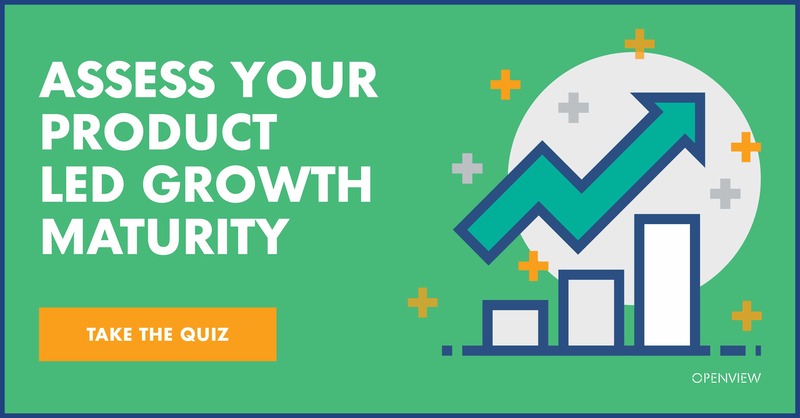 Want more on product led growth? Sign up to receive our PLG eBook.